Amazon-Morrison deal: Big disruptor to the UK grocery market? The UK grocery market is reverberating from the news that Amazon has paired up with supermarket chain Morrisons to firmly establish its place in the fresh produce market. Under the agreement, Morrisons will supply “hundreds of its products” which will include fresh food to Amazon Pantry and Prime customers. The Amazon Fresh Service has already been quite successful in parts of the US, but the UK grocery market is competitive and a tough one to crack. 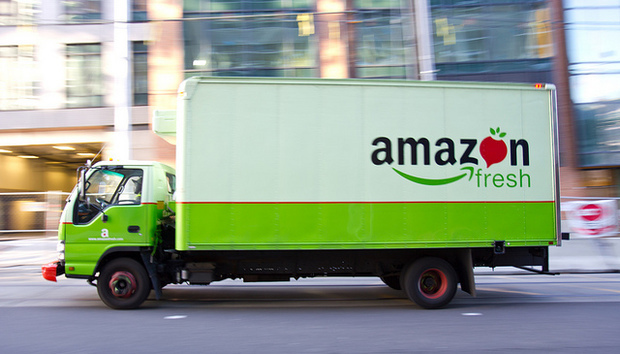 Will this new deal help Amazon establish its presence in the UK grocery market and is it the right move for Morrisons? Why is this deal great for Amazon? “For Amazon it’s about strengthening their position in fresh food as they haven’t properly established the Amazon Fresh Service. So by bringing in a big supermarket they are developing a stronger proposition [in this market]. I think you should see it as a possible stepping stone towards a wider grocery offering in the UK,” says David Grey, Senior Retail Analyst at PlanetRetail. According to Grey, cracking the $247 billion British grocery market is no easy feat. As reported by Fortune, online orders and deliveries are a big business in the UK grocery market and accounted for roughly 5% of the whole UK grocery market last year. “Obviously Amazon is industry-leading in supply chain and capability but they don’t really do fresh food – their strength is always in non-food logistics. The UK online grocery market is already extremely well developed – it’s not going to be a quick win for them,” says Grey. Daniel Lucht, Global Research Director at ResearchFarm thinks the Morrison deal will give Amazon the “leg-up” it needs to become a solid player in the UK grocery market. How will this deal benefit Morrisons? Traditionally, Morrisons has tended to lag behind the other three leading supermarket chains (Tesco, Asda, and Sainsbury’s) in the online market. Its mistake was waiting until 2013 to finally launch its online grocery delivery service. Since the deal announcement, Morrisons shares jumped up 6.5% but will Morrisons be shooting itself in the foot in the long-term with this Amazon deal? Lucht thinks in the short-term this could be great – but in the long run this deal could come back to bite Morrisons. Jerry Sheldon, Analyst at IHL Group also is of the opinion that in the immediate term, this will be great for Morrisons and will allow them to “recoup share at a time when Asda is beginning to gain traction with online grocery delivery themselves”. But he warns that at some point Morrisons could be cut off when they are no longer needed by Amazon.